When I'm looking for make up I must admit their ingredients are not a big factor to me, they are with skincare, I always look for products without mineral oils as their main ingredients and I don't know why I haven't thought this way when it comes to make up, isn't and shouldn't make up be an extension of our skincare routine? I know a lot of people would disagree with me and try and source out natural alternatives for their make up needs. More and more people are now looking at a more natural approach and maybe I should think about what these ingredients are doing to my skin, after all we only have one face, don't we. 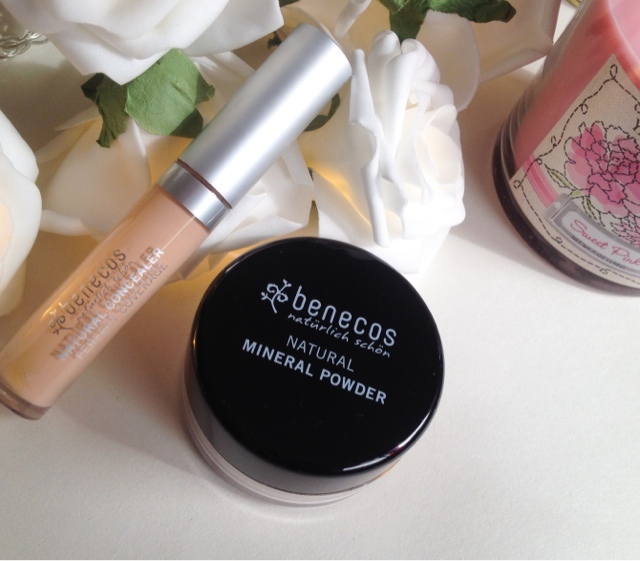 The pieces I have been trying out come from Benecos, a brand that produces natural and organic make up and skincare products, all free from mineral oils, paraffin's and silicone's and are on Peta's list for companies that don't test on animals. It's only recently I started to use and try mineral make up and I was interested to see how this would fair against the one I was already using. The filly milled powder feels lightweight on the skin creating an even veil the doesn't cling to pores, evens out skin tone and texture while delivering a good light- medium coverage finish. 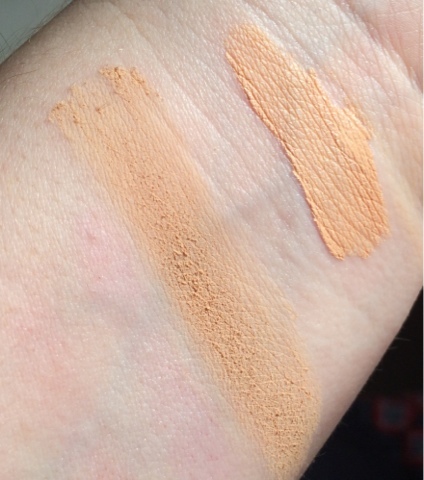 The colour I have is Medium Beige which would normally be too dark on my pale complexion but I'm fake tanning at the moment in preparation for the coming season and the colour is perfect (note: the swatch above is on my natural skin colour, without fake tan). The powder delivers a matte finish, good news to any one with oily to combination skin as the powder helps to absorb excess oils due to the Kaolin Clay ingredient, which also helps with inflammation and redness. 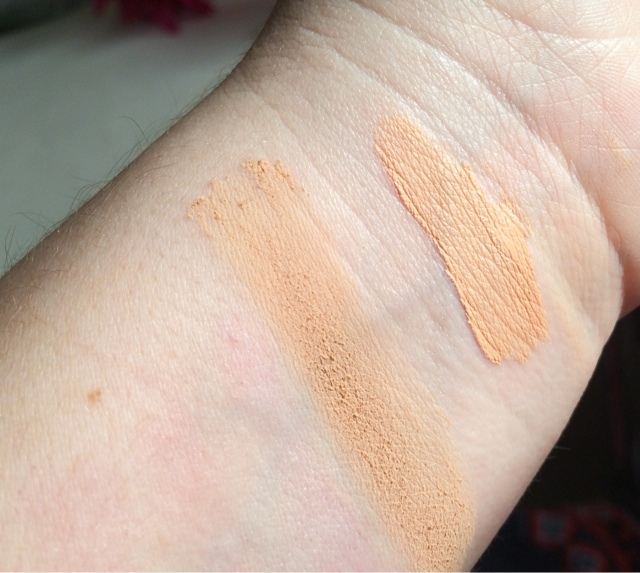 The concealer I have is in the shade 'light' which I found to be slightly too dark to use under my eyes to highlight and brighten but matched my fake tanned skin tone well, it is on the warm side so some people might find this a problem as it is the lightest shade they do. It does cover well and oily skin types may like it as it's quite a dry formula meaning it doesn't slide all over the place like some do. 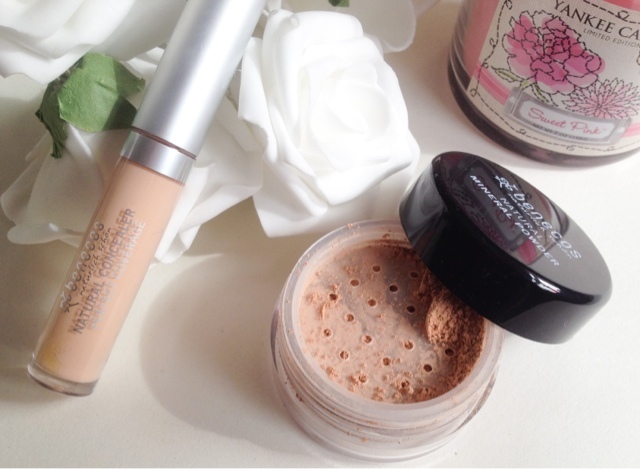 I personally found it to be a bit too dry and it had the tendency to look at little cakey on my skin, this could be because I do prefer a more solid concealer, not really one for cream concealers in general so it's down to personally preference really. Overall I'm pleasantly surprised, I always thought that natural products would be somewhat inferior to ones that contain chemicals and such, thinking they wouldn't work as well, I don't know why I thought this but my feelings have now changed and It's nice to know that my skin is being looked after a bit better when wearing them. The star product for me has to be the powder which gives a lovely and natural finish to the skin whilst delivery good and even coverage. If you're looking for natural make up and skincare items there's a whole array on the Pravera website. What are your thoughts on natural make up, is it something you look out for? These look like really nice products - the 'light' does look pretty dark for a concealer though! !